The results are in and Coconut Grove is the new champion of Curbed Miami’s Neighborhood of the year! 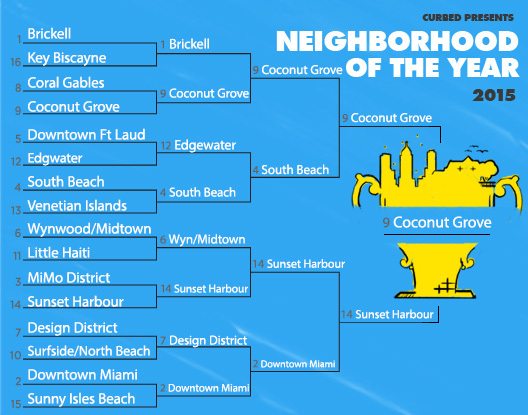 The competition included 16 of Miami’s best neighborhoods and the Grove defeated some stiff competition in bracket-style head to head voting. The historic neighborhood topped the likes of Brickell, South Beach and finally taking down Sunset Harbor in the finals of the bracket. You can check out Curbed Miami’s article here for more information. This entry was posted on Tuesday, January 5th, 2016 at 12:46 PM and is filed under City News. You can follow any responses to this entry through the RSS 2.0 feed. Both comments and pings are currently closed.